Get active. Whether it is gardening in the sunshine or walking around the block, every step counts when it comes to your heart as a muscle. Get a good night’s rest. Sleep is imperative for your body to relax and to renew. Dance it out. Regardless of age or ability, everyone can express themselves through dance, and dancing is good for the soul and the body. “Living in a healthy way isn’t a one-size fits all approach. 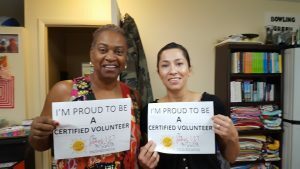 Think of healthy living is about what brings you joy and keeps you healthy for years to come,” Camille Jordan, Chief Nursing Officer at Signature HealthCARE, said. 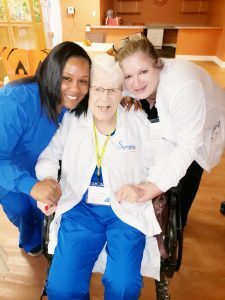 Whether it’s going for the gold at Senior Olympics or dancing with a partner in the Back in Time program, Signature HealthCARE takes a one-of-a-kind approach to Quality of Life by inspiring patients and residents to continue dreaming. This entry was posted in Uncategorized on September 24, 2018 by ccrenshaw. 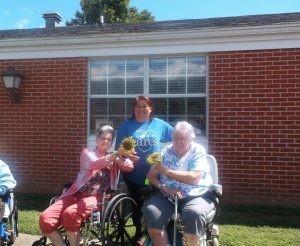 September 21, 2018, Louisville, Ky – Regardless of physical ability or diagnosis, creativity and art empower Signature residents to create and to live with purpose. 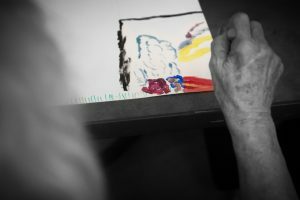 Whether it be painting, music, dancing, drama, or simple crafts, something beautiful happens when artistic creativity is encouraged, especially in long-term care. This is a story of a Signature HealthCARE of Hart County resident rediscovering joy by through art. She rolled up to a table in the Quality of Life room and closed her eyes. “What colors do I see?” She said inquisitively. She then opened her eyes and began to paint different colors on a piece of canvas. “Hmmmm, what shall I make next?” She kept asking herself as she added more colors. “I know! I’ll make a shooting star!” She shouted excitedly, so loud that it startled us and the kids a bit. “Now! We all need to add something,” she said as she handed the camp director Christine and I some paintbrushes. We gladly complied and added our favorite colors into her artwork. After her first piece of artwork was finished, she wanted to immediately create another, and said, “I’m going to do my absolute best this time!” She started the artwork off with what looked like a rainbow. 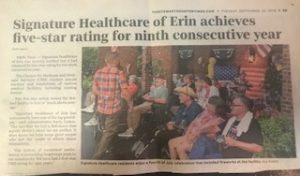 What happened next had Signature HealthCARE of Hart County stakeholders in tears of joy and watching her create art in absolute silence. Her lyrics may not have been the “correct” words to the famous song from the Wizard of Oz, but that didn’t matter. Her sweet voice warmed all of our hearts. One stakeholder began playing the song in the background as she continued singing and painting. “It doesn’t get much better than this,” she said as she finished her second work of art. She can’t tell you what day it is, but her smile is absolutely contagious. She is joy to be around. 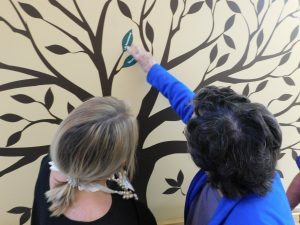 She had participated in an art project recently with our resident artist, Andee, as a part of the “I Won’t Grow Up” project happening in 12 rural Signature HealthCARE nursing homes. She and other elders were asked to create an art piece of how flying made them feel. You could tell she truly enjoyed every second of it, and she wasn’t the only one who opened up and let their creativity shine through. This entry was posted in Uncategorized on September 21, 2018 by ccrenshaw. 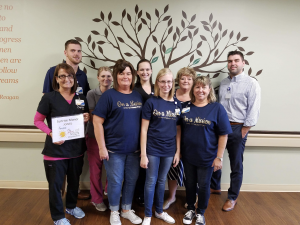 Prestonsburg, Ky – September 20, 2018 – Riverview Health Care Center is celebrating a landmark step in the international culture change organization for health care, the Eden Alternative Registry, and it is the first in Kentucky to reach the third milestone. The achievement reflects the center’s commitment to the person-directed care philosophy and empowering both elders and stakeholders. The milestone requires the health care center to achieve specific cultural changes. Hallways in the center are neighborhoods with unique names, Willow Creek for example. Mayors of each neighborhood are empowered to transform schedules from rigid, traditional health care concrete schedules to times that are what the elder desires. Families of elders get involved in the Eden process, too. Families are involved in daily decision-making, the community’s daily rhythm, and celebrations. 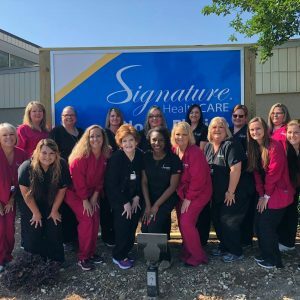 Earlier this year, Signature HealthCARE marked its 50th location named to the Eden Alternative Registry and won the international organization’s Eden Champion Award. “This milestone is also about living out servant leadership. 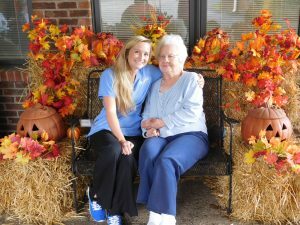 All leaders are, or in the process of, becoming certified nursing assistants,” Allen said. 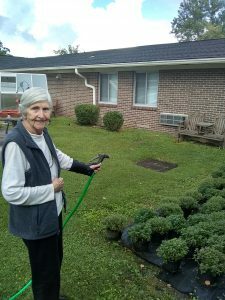 The Eden Alternative Registry, an international non-profit, works to transform the well-being and daily life of elders who call nursing homes their home with the person-directed care philosophy. Communities on the Eden Alternative Registry experience less staff turnover, according to data from a survey of 2011-2016 members of the registry. This entry was posted in Uncategorized on September 20, 2018 by ccrenshaw.